Dermal fillers are essentially soft, smooth gels that are injected under the skin to restore volume and fullness to the face. Many dermal fillers are made out of hyaluronic acid, a substance that helps keep the skin firm and nourished, but all dermal fillers are made out of substances that are based on natural body fluids. Dermal fillers often have unique formulas that give them different qualities; smoother, softer gels are often more appropriate for delicate areas like the lips, while sturdier gels are more optimal for lifting larger areas. Dr. Machida’s patients will get to choose between Radiesse®, Juvéderm®, Restylane®, and Sculptra® for their rejuvenation treatment. Dr. Machida will consider the patient’s aesthetic goals and unique anatomy before helping patients choose the right filler or combination of dermal fillers. Dermal fillers are safe for patients of all skin tones, and many of them are FDA-approved for patients 21 and older. As remarkable as dermal fillers might be, what really matters is who’s performing your procedure. At Second to Creation, your dermal fillers will be performed by Dr. Machida, a renowned facial plastic surgery specialist from the Inland Empire. Before each treatment, Dr. Machida will evaluate your facial structure and determine the best sites to inject each dermal filler. He might also take photographs and mark the injection sites to make sure his injections are as accurate as possible. Then, your face will be cleansed with an antiseptic. 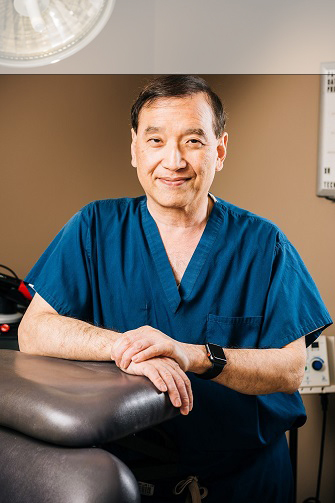 To make sure the patient is as comfortable as possible, Dr. Machida will apply a local anesthetic to the treatment area or give a local anesthetic shot to numb the area. The anesthetic shots are quite tolerable, and they’ll prevent the patient from feeling any kind of pain. Dr. Machida will then administer the dermal fillers, making sure to make the injection as painless as possible. After each injection, Dr. Machida will massage the injected area and apply additional volumes of the filler as needed. The entire treatment takes around 15 minutes to an hour to complete, depending on the number of injection sites. Once you’ve attained your desired results, you’ll have the markings cleaned off and you’ll be able to go back to your daily errands or even go back to work. Some patients experience swelling, bruising, and soreness in the injection sites after the treatment. These side effects are only temporary, but Dr. Machida will provide an ice pack to help with the swelling or discomfort. The sites of injection will feel tender for 1-2 days, but many patients get by without any need for medication. Dermal fillers are remarkably advanced treatments, but they still need to be delivered by an experienced, artistic hand. To have your treatment performed by a true facial plastic surgery expert, contact Second to Creation in the Inland Empire now for a consultation. At STC Plastic Surgery, we offer effective facial fillers and skin treatments, including Bellafill injections, in the Inland Empire. This cosmetic filler can help you look younger and enjoy smoother, beautiful skin. Bellafill is a collagen-based dermal injectable that contains polymethyl methacrylate (PMMA) microspheres. These spheres are quite small and are suspended on a sturdy foundation of collagen. This promotes instant volume and lift to help correct both wrinkles and depressions caused by acne scars – and results will only get better over time, for up to 5 years. Once injected, the microspheres promote smoother-looking skin, plumping soft tissue to restore youthful facial volume. Is Bellafill Facial Filler Right for You? If you are currently dealing with fine lines and wrinkles or scarring caused by previous acne breakouts, Bellafill treatments provide beauty and natural tissue volume to minimize these aesthetic concerns. Results help patients feel confident in their own skin. This long-lasting dermal filler has proven to be effective for cosmetic patients with facial lines in multiple areas, including the forehead, under eyes, midface, near the mouth, and around the eyes. 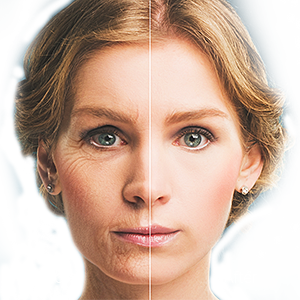 Treatment is used for long-term facial rejuvenation purposes, as results can last for years. This means fewer appointments and reduced cost. When used as an acne scar treatment, results can last as long as twelve months. Both men and women with a variety of skin types can benefit from dermal fillers. The ideal patient is over the age of 21 and has mild to moderate signs of facial aging or visible scarring they would like to reduce. To enjoy best results, it is imperative to have realistic expectations following treatment. If you do happen to have a history of severe allergies or a bleeding disorder, inform the doctor before pursuing dermal injections. Many patients are attracted to facial fillers because they provide aesthetic results almost instantly and require no downtime for recovery; you can return to your normal schedule after your appointment. Bellafill provides this level of efficiency with the added benefit of truly lasting improvement; while many popular fillers last for months or a year, Bellafill’s effects are durable for up to five. It is common to experience temporary swelling, redness, mild pain, bruising, and itching after treatment, but these symptoms are only temporary, and usually last no longer than a week. 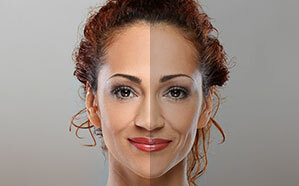 You no longer have to be embarrassed because of wrinkles and acne scars While these types of blemishes are out of your control, and just a natural part of life, there are readily available options to help counterbalance these issues to create the skin tone and texture you’ve always wanted. This injectable is the perfect acne scar treatment, as well as a great choice for long-term, nonsurgical facial rejuvenation. Some side effects from dermal fillers might include swelling, bruising, and soreness. These side effects are temporary, and they should dissipate after a few days. If you got lip injections, it might take a few more days for the swelling and bruising to go down. How Soon Will I See Results with Fillers? You’ll see an immediate improvement after your treatment with fillers, but you should also take the side effects into consideration. You’ll experience some swelling and bruising after your treatment, but once that subsides in a few days, your full results should emerge. No. Dermal fillers have specific formulations that make them optimal for different parts of the body.For instance, dermal fillers like Restylane® are optimal for tear troughs under the eyes, while fillers like Juvéderm® are great for plumping the lips. Other dermal fillers, like Radiesse® contain calcium microspheres in the formula that stimulate long-term collagen production. Because its results can last for up to 1 ½ years, Radiesse® is commonly used for lifting the cheeks. Sculptra®, on the other hand, has a special gel that also stimulates collagen production, allowing its results to last for a remarkable two years. Are Fillers Better than BOTOX®? Although they’re both injectables, dermal fillers and BOTOX® are incredibly different—enough that they complement each other and are often used together. BOTOX® is commonly used for expression lines—the wrinkles that result from years of facial movement. Dermal fillers are more for static lines—the wrinkles that appear even when the face is at rest. A dermal filler can last anywhere from 6 months to 2 years—it all depends on the filler’s specific formula. Dermal fillers are temporary because they’re made out of natural substances and they’re eventually absorbed by the body. For the best results, Dr. Machida can help you plan out a schedule and recommend the best times to get a new round of injections.